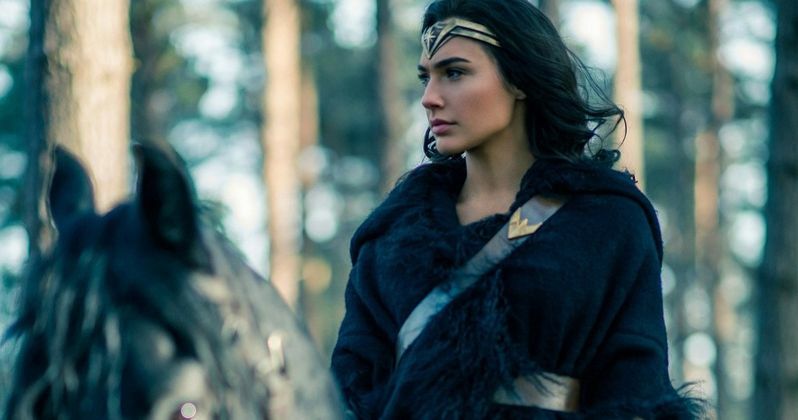 While some filmmakers can not be found at all on social media, Wonder Woman filmmaker Patty Jenkins is not one of them, sharing behind-the-scenes insight from various stages of the production. While the post-production process is still under way on this DC superhero adventure, the director recently took to social media to share a new photo from a recent scoring session. She also teased seeing the final effects for the movie, which is set to arrive in theaters nationwide June 2. Here's what the filmmaker had to say on social media below. "Man! Last many Fridays have been some of the best in my life. Seeing final effects and recording EPIC score!? !Brings tears to my eyes #love"
The filmmaker would not reveal on Twitter where this scoring session is taking place, but it comes just a few days after director James Gunn shared a few videos from the scoring session of his Marvel superhero movie, Guardians of the Galaxy Vol. 2, which kicks off the summer movie season on May 5. Unfortunately, Patty Jenkins wouldn't share more details on the "epic score" but the soundtrack is being composed by Rupert Gregson-Williams. If the Wonder Woman trailers are any indication, then this movie will also carry over the Wonder Woman theme introduced in Batman v Superman: Dawn of Justice, which was composed by Hans Zimmer. In what is becoming a tradition of sorts among DC Comics movies, a rumor recently surfaced from a "DC insider" that claims this superhero movie is "discombobulated" and "disjointed," and that the movie suffers from a lack of "narrative flow," although Patty Jenkins shot down those reports. There had been similar reports that had surfaced before Batman v Superman: Dawn of Justice and Suicide Squad, both of which were considered critical failures, but still managed to pull in some decent numbers at the box office. Batman v Superman: Dawn of Justice pulled in $330.3 million at the domestic box office and $873.3 million worldwide, while Suicide Squad earned $325.1 million domestic and $745.6 million worldwide. Still, both movies were out-grossed domestically by the R-rated Deadpool and Captain America: Civil War. Despite the critical drubbing Batman v Superman: Dawn of Justice took, one of the few high points for most critics was the debut of Gal Gadot's Diana Prince, a.k.a. Wonder Woman. Batman v Superman: Dawn of Justice also set up that Wonder Woman does not exactly look her age, with Ben Affleck's Bruce Wayne discovering a photo of Diana from World War I that dates back 100 years, where she's seen alongside a number of Wonder Woman characters such as Chris Pine's Steve Trevor. Wonder Woman will take fans to the title character's homeland of Themyscira, along with World War I-era London, with a third setting bringing the title character back to present day, most likely to connect Wonder Woman with the upcoming Justice League, in theaters November 17. In related news, Warner Bros. employee Ken Pejoro shared a new photo of Gal Gadot in Justice League, which shows Gal Gadot interacting with Ben Affleck's Batman. The photo was presumably taken from one of Warner Bros.' soundstages, with Gal Gadot sharing another version of the same photo on Instagram. The actress is seen standing in front of a microphone, presumably recording ADR (additional dialogue recording) for the movie. The image also features the timestamp 2:09:40:16, which seemingly indicates this scene takes place later on in the movie, but we still don't have an official runtime in place for Justice League quite yet. It's possible that Zack Snyder could be working on the "Ultimate Edition" of Justice League, meaning this could be actually closer to the middle of the film, instead of the end, but that hasn't been confirmed. Before she was Wonder Woman, she was Diana, princess of the Amazons, trained to be an unconquerable warrior. Raised on a sheltered island paradise, when an American pilot crashes on their shores and tells of a massive conflict raging in the outside world, Diana leaves her home, convinced she can stop the threat. Fighting alongside man in a war to end all wars, Diana will discover her full powers...and her true destiny. Gal Gadot leads a stellar cast that also includes Ewen Bremner, Robin Wright, David Thewlis, Danny Huston, Elena Anaya, Lucy Davis and Connie Nielsen. Wonder Woman will go up against 20th Century Fox's animated adventure Captain Underpants on June 2, situated smack-dab in the middle of two Marvel movies, Guardians of the Galaxy 2 on May 5 and Spider-Man: Homecoming on July 7. Take a look at Patty Jenkins' photo below from a Wonder Woman scoring session.